Supreme Court Halts Wisconsin Voter ID Law; Texas Law Overturned : The Two-Way After an appeals court put Wisconsin's law back into effect, the Supreme Court put the law on hold while the justices decide whether to take the case. 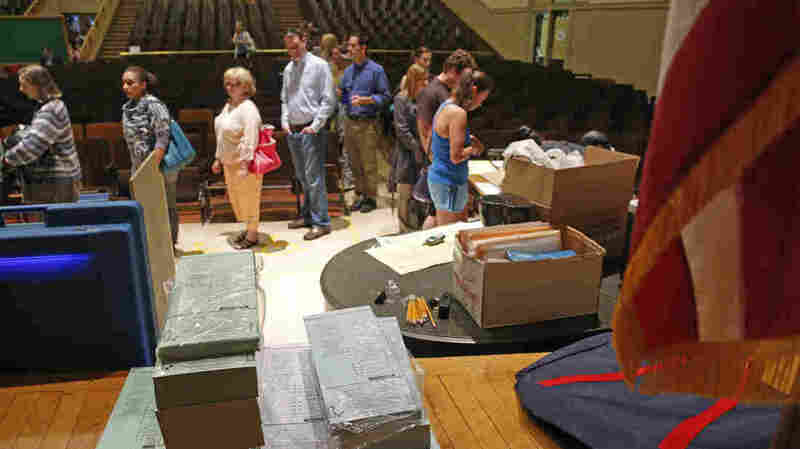 Ballots are stacked and ready as voters wait in line during the 2012 primaries in Milwaukee. An appeals court ruled Monday that a Wisconsin voter ID law, on hold since 2011, could go into effect, but the Supreme Court stepped in on Thursday night to halt the law again as it decides whether to take the case. "Election leaders here had been rushing to enact the law since September 12, when a federal appeals court ruled that Wisconsin could require voters to show photo identification. Earlier court decisions had halted the law for most of the three years, since the Legislature approved Voter ID in 2011. "Wisconsin Attorney General J.B. Van Hollen has defended the law. He said, following Thursday's court ruling, that he still believes Voter ID is constitutional. "Supporters insist the requirement to show photo identification is reasonable and will deter fraud." NPR's Pam Fessler notes that while Samuel Alito joined fellow Justices Antonin Scalia and Clarence Thomas in dissenting, he expressed concern about imposing the law so close to the election. "That was one of the main arguments that opponents of the law had made — that it was too late to put this law into effect this year," Pam tells Morning Edition. "It had been on hold for two years until in September a federal court ruled that it could go into effect. 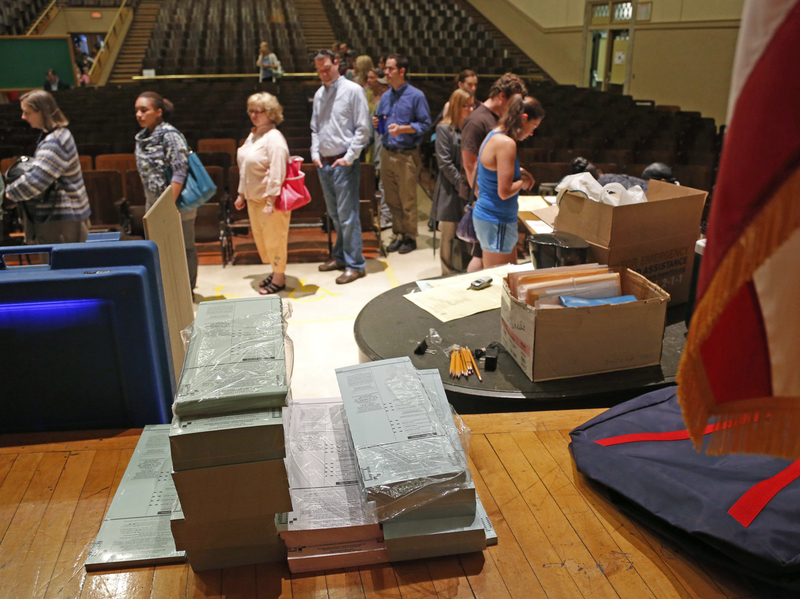 But by that time, the state had already sent out hundreds of absentee ballots that did not include ID instructions. So election officials were going to have to track down each of those voters and have them send in a copy of their ID so their votes would count, which was quite a mess. Now those votes will count." Meanwhile, a federal judge in Texas overturned that state's new voter ID law, a ruling the state's attorney general says will be appealed immediately, The Associated Press reports. The Justice Department had argued that the law would have left 600,000 Texans, mostly blacks and Hispanics, without sufficient identification to vote in November elections, according to The Associated Press. "Texas has one of the strictest voter ID laws in the country, and voting rights groups challenged it as discriminatory. Last night, District Court Judge Nelva Gonzales Ramos agreed. In a strongly worded opinion, she said the law discriminated against the state's Hispanic and African American voters, because they're less likely to have the required government-issued photo ID, and could have a more difficult time getting one. She said that the law effectively imposed a poll tax because some voters would have to pay to get documents — such as a birth certificate — needed to get a photo ID. Perhaps more importantly, she found that the state enacted the law with the intention of discriminating against voters. "I should say that within minutes of her ruling, the Texas attorney general's office issued a statement that the state would immediately appeal. So this is definitely not the last we're going to hear on this. There's still some question whether or not Texas voters will have to show ID in this year's election." This story has been edited to clarify the Voter ID law's history.